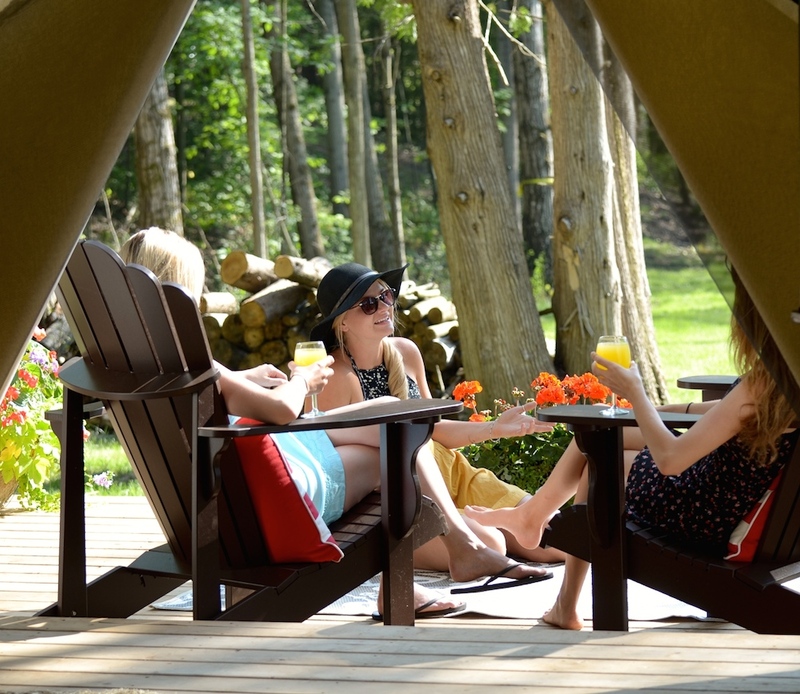 In August, a new glamping spot in Ontario, Canada welcomed its first guests to experience the province’s pristine outdoors in style and luxury. During a particularly warm few days in September, I left the city behind and checked into this tranquil piece of paradise. Located an hour and a half from the Toronto concrete, near Cobourg, Ontario, Whispering Springs Wilderness Retreat offers all the five-star frills of a carefully curated boutique hotel, right in the heart of the forest-covered Canadian wilderness. 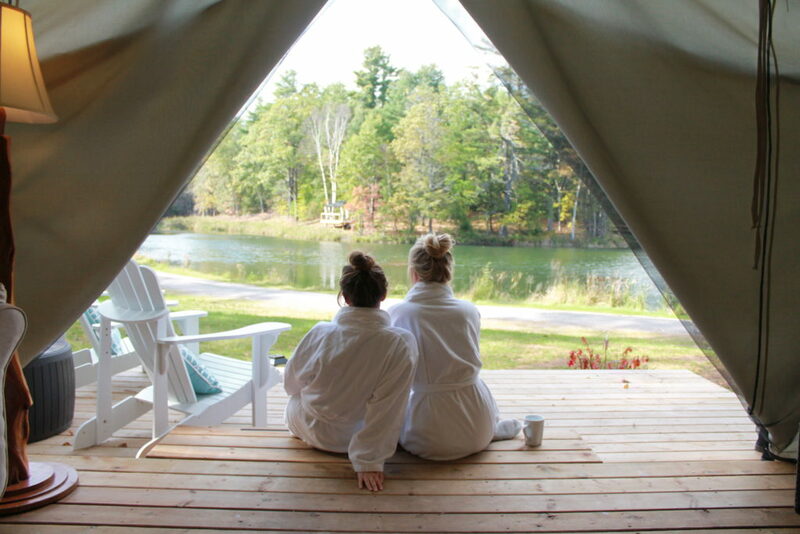 While the idea of glamping (glamorous camping), has been slower to catch on in Ontario than it has in places like British Columbia and California, it has recently increased in popularity globally, as getaway-seekers crave a fresh air and starry sky-filled escape from the grind, and a place to reclaim a sense of inner peace. The experience eliminates the work and “roughing it” element typically associated with camping – a definite bonus for pavement-pounders like myself looking for a hassle-free way to unwind and connect with nature. While you can still hear the sound of the rain and birds outside from your log-framed safari tent at Whispering Springs, you can do so cozily nestled under the luxurious fine linens of your king-size bed – perhaps after a soothing bubble bath in the soaker tub in your en-suite bathroom. 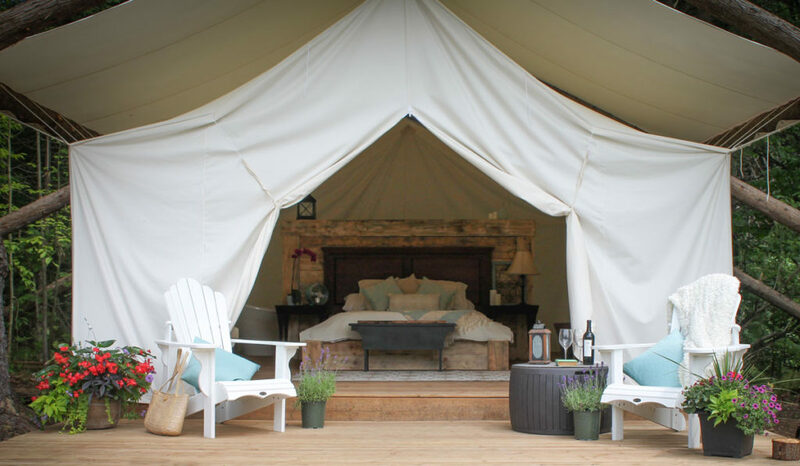 Each of the deluxe safari tents has its own thoughtful theme and looks like it is straight from the pages of an interior design magazine, with rustic-chic furniture, plush towels and one-of-a-kind reclaimed elements (the “Savanna” tent, for example, features a custom-made bed from reclaimed barn beams). Appreciated added touches include flashlights, solar lanterns and Oneka bathroom products. Most existing tents have a view of the quaint spring-fed pond, and all feature a private deck with Muskoka chairs – perfect for reading or morning conversations over coffee. Also helping your quiet time cause are the hammocks that complete the photo-worthy exterior of the campsite. Each tent features a private barbeque and dining area, but a big pre-trip grocery run isn’t necessary; barbeque baskets are available for order. 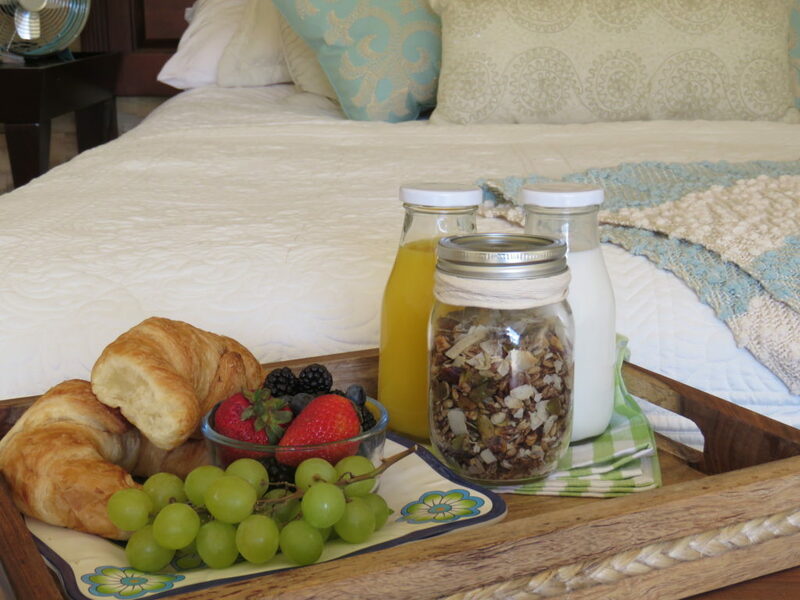 In the morning, guests are greeted with a basket of homemade baked goods, fruit and fresh juice – all of which were better enjoyed from bed. Each tent features a mini-fridge and guests are free to bring their own wine. While the tents and the common areas have electricity, expect to disconnect completely; cell phone reception is spotty at best on the property and Wi-Fi isn’t part of the experience – something that made it all the more refreshing. The tree-filled, yet open 200-acre property is beautifully manicured, with a sprawling lawn that surrounds an outdoor saltwater pool and hot tub, a lodge-style pavilion and a guest lounge and bar. A tennis court and possibly horse stables are also in the plans as the resort expands. 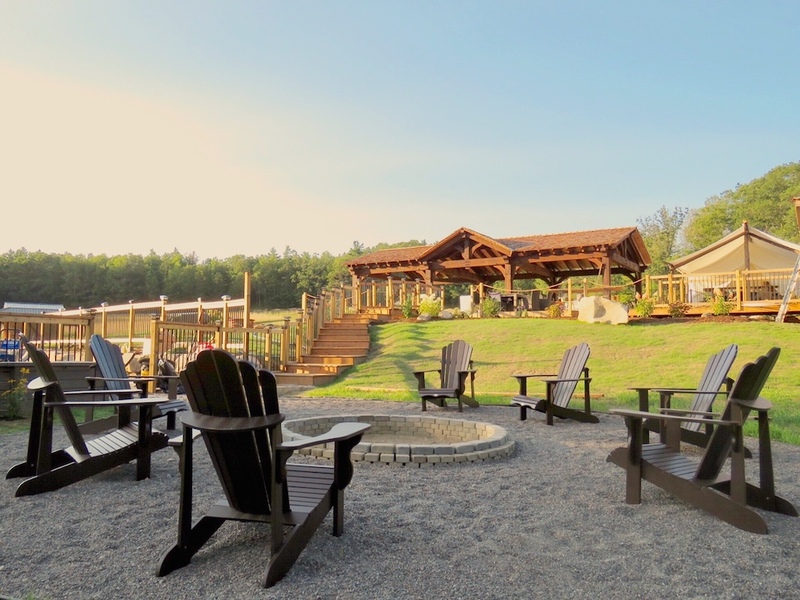 A day at Whispering Springs could include a morning yoga session, a hike through the forest, paddle boating or fishing in the pond, getting a pond-side massage or engaging in some friendly competition in a beach volleyball game or horseshoe match. As the day comes to a close, guests gather for Magic Hour at The Watering Hole Guest Lounge and Bar to enjoy a complimentary glass of (delicious) wine from renowned Prince Edward County wineries or local craft beer. Here, you’ll also find healthy snacks for purchase. A Muskoka chair-filled communal campfire area offers a chance for guests to mingle over gourmet s’mores once the sun goes down. Guitars and other instruments are free for guests to use and often make their way down to the fire. Throughout the season, Whispering Springs will host wellness retreats lead by an in-house holistic nutritionist and yoga instructor. Offering a blend of relaxation, yoga and meditation – complete with a side of calming country air – the retreats include a full spectrum health analysis and rejuvenating body reset. Guests can expect diet and health consultations and seminars, a plant-based vegan diet, live and dry blood analysis, Thai and Lomi Lomi massage, meditative forest walks and group therapy sessions around the campfire. While luxurious, the experience at Whispering Springs is far from stuffy or pretentious. Owners John and Nancy Corcoran and their family know exactly how to make guests feel at home and couldn’t have been more hospitable. In fact, in my opinion, one of the best features about Whispering Springs is that it’s family-run – and by a family with seasoned experience when it comes to hospitality. The Corcorans were key players in the early years of the neighbouring Ste. Anne’s Spa, where Nancy was the innkeeper, and the couple also host private charters on their 50-ft sailboat in the Bahamas. Influences from Ste. Anne’s Spa are felt in everything from the plush white bathrobes, to the fresh flowers and premium bath products. In addition to memorable weekends away for couples and friends (the spot currently isn’t family-friendly), Whispering Springs will host weddings (there’s even a chapel in the forest) and corporate retreats once it opens again next spring. I will definitely be back. Reservations are now open for the 2018 season. Erin Davis is the Digital Media Manager for Travel to Wellness and a regular contributor.